Kaylan performing in 2008 billed as "The Turtles Featuring Flo & Eddie"
Howard Kaylan (born Howard Kaplan, June 22, 1947) is an American rock and roll musician and writer, best known as a founding member and lead singer of the 1960s band The Turtles, and as "Eddie" in the 1970s rock band Flo & Eddie. Kaylan was born in the Bronx to a Jewish family and grew up in Utica, New York and Westchester, a suburb of Los Angeles. He studied choral music and clarinet, and won a Bank of America Fine Arts Award at age 16. He graduated early (as valedictorian) from Westchester High School, and briefly attended University of California, Los Angeles on a scholarship. Kaylan and Mark Volman founded The Turtles, a popular band of the late 1960s. At the end of 1970, Kaylan and Volman signed on as members of Frank Zappa's band, The Mothers of Invention. The pair recorded tracks on five albums, toured to support them, and appeared in the film 200 Motels, a semi-documentary film directed by Zappa. They were compelled to use the names Flo & Eddie ("Flo" being shortened from "Phlorescent Leech") and were not allowed legal use of their own names, or that of The Turtles, until multiple lawsuits from that band were settled in 1985. In 1985 the name "The Turtles" reverted to Kaylan and Volman after fifteen years in litigation, as well as all of the master recordings they made. Thanks to Burger King, the NFL, Sony PlayStation, and countless other television advertisements and motion pictures, the Turtles' catalog remains a staple for licensing and reproduction in the twenty-first century. Flo & Eddie released nine albums on Warner Bros. Records and Columbia Records in music; in film they provided music and voices for animated films like Down and Dirty Duck; and they appeared in radio broadcasting. In the 1980s, "Rock Steady With Flo and Eddie" was recorded in Kingston, Jamaica, and the partners began writing comedy and script with Chris Bearde, Larry Gelbart and Carl Gottlieb. Simultaneously, they began writing regularly featured columns for Creem, Phonograph Record Magazine and the Los Angeles Free Press. They also produced many albums for other bands and artists, as well as singing backing vocals on over 100 albums. Flo and Eddie can be heard singing with John Lennon, Bruce Springsteen, Ramones, Blondie, Duran Duran, The Psychedelic Furs, T.Rex, Alice Cooper and many more. Flo and Eddie appeared as The Phlorescent Leech and Eddie on Frank Zappa's 1970 album Chunga's Revenge and in 1971 as lead vocalists on Zappa's Fillmore East album as Howard Kaylan/Mark Volman where they sang "Happy Together", then on Just Another Band From L.A., 200 Motels and much later Playground Psychotics and other Zappa compilations of old live concerts from 1970–71. In the mid 1990s, Kaylan turned his attention to the collecting and writing of dark fantasy literature and science fiction. He wrote two short stories, by way of experimentation, and both were published in the best-selling anthologies, "Phantoms of the Night" and "Forbidden Acts." He also currently pens the widely read "Eddie's Media Corner" on the official website. He portrayed an orthodox minister who "married" Laura to Stavros in a dream sequence on General Hospital, an old hippie on Suddenly Susan and a younger one on the It's Garry Shandling's Show. In 1983, Kaylan appeared in the rock and roll comedy Get Crazy, starring Malcolm McDowell and Daniel Stern. Kaylan played the part of Captain Cloud, a spiritual guru type of character, leader of a caravan of time lost gypsy-like hippies. In 1987, Kaylan and Volman appeared in a new music video of the song "Happy Together", made in order to promote the romantic comedy Making Mr. Right, which featured the song during its end credits. In 2001, Kaylan wrote a treatment for a very short film about his first night on tour in London. After taking it to his friend (and Rhino Records president) Harold Bronson for input, the project was lengthened and shot as a one-hour movie. The following year, scenes were added and it was back into the movie studio once again to complete what would now be a full-length feature. My Dinner With Jimi thus became the first film written by Kaylan. It was produced by Bronson for Rhino Entertainment, and directed by Bill Fishman (Tapeheads, Car 54, Where Are You?) for Fallout Films. In 2005, Kaylan appeared in a featured role in Stephen King's Riding The Bullet. Kaylan's autobiography "Shell Shocked: My Life with the Turtles, Flo and Eddie, and Frank Zappa, etc." was published by Backbeat Books in March 2013. The book was written with Jeff Tamarkin, and included a foreword by Penn Jillette and cover art by Cal Schenkel. 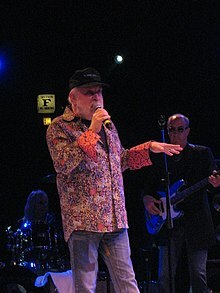 ^ "Howard Kaylan". IMDb. Retrieved December 26, 2008. ^ "The Turtles Website/History pt. 1". Flo & Eddie, Inc. 2006. Archived from the original on December 7, 2008. Retrieved December 26, 2008. ^ a b "The Turtles Website". Retrieved December 26, 2008. Rock and Roll is Here to Stay…Oy Vey! This page was last edited on 18 April 2019, at 15:30 (UTC).